An abandoned baby duck is too young to survive long on its own. Ducklings are susceptible to hypothermia and drowning as they are not yet able to produce the oil necessary to keep water off their feathers. They also make tasty treats for predators such as dogs, cats, raccoons and larger birds. While some will let nature take its course, the choice to save a helpless duckling requires little effort. Often, a duckling is abandoned by his mother when he is sick, injured or simply a late hatchling. Check the duckling you've found for any obvious signs of injury or illness such as bleeding, the inability to walk or a cold temperature. If anything appears odd, gather it up and call a local wildlife facility or specialty veterinarian. Even if they cannot assist in picking up the duckling immediately, they should be able to refer you to an alternate organization to assist you. Provided the duckling does not appear sick or injured, pick him up. There's no need to worry that the mother will reject her baby if he has been touched by you; this is not the case. Walk around the area to determine if his family is nearby. Should you locate the flock, place the duckling down and take a few steps back to see if his mother will respond to his cries and come back to collect him. Other than this interaction, limit overhandling the duckling to avoid accidentally causing injury. If the duckling is truly abandoned, he needs temporary housing. Place him in a large cardboard box or plastic tub. Leave the top off for ventilation and line the bottom with paper towels, not newspaper, for traction. Ducklings need to be kept warm; placing a desktop lamp, or 75 watt light bulb, over one corner of the box should provide adequate heat. The duckling can move to the more shaded side if he becomes too hot. Placing a thermometer in the bin helps you ensure the temperature remains around 75 to 80 degrees Fahrenheit. A duckling found weak or staggering should immediately be given a mix of sugar water, applied to the tongue. He may be suffering from lack of proper nutrition and could die if unresponsive to the mixture and food within half an hour. 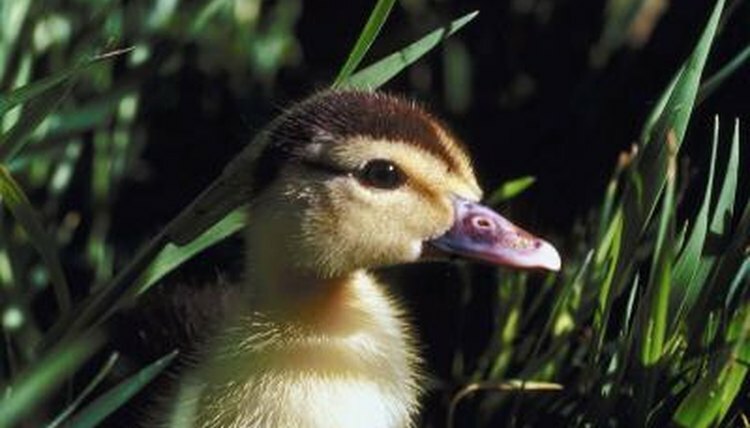 Find duckling-specific feed at farm or pet stores. In the meantime, offer him crumbled bread, cottage cheese, oatmeal, chopped greens or a hard-boiled egg with a finely chopped shell for calcium. Always provide clean, fresh water in a very shallow dish so the duckling does not drown. Not everyone can look after a duckling until he fully heals or produces the necessary waterproof oil for his feathers. He must also be able to fly and find his own food to survive. It's illegal in many areas to raise a wild animal, even for rehabilitation purposes, so it's best to contact local wildlife organizations, specialty veterinarians or farms to see if they can rehabilitate a duckling or recommend someone who is willing to take him in. These professionals are better equipped to oversee the duckling's health and facilitate a successful release after a few weeks' care.